France said Thursday there has been a "major dysfunction" in a recall of baby milk after stores sold potentially contaminated products despite being told to take them off shelves. 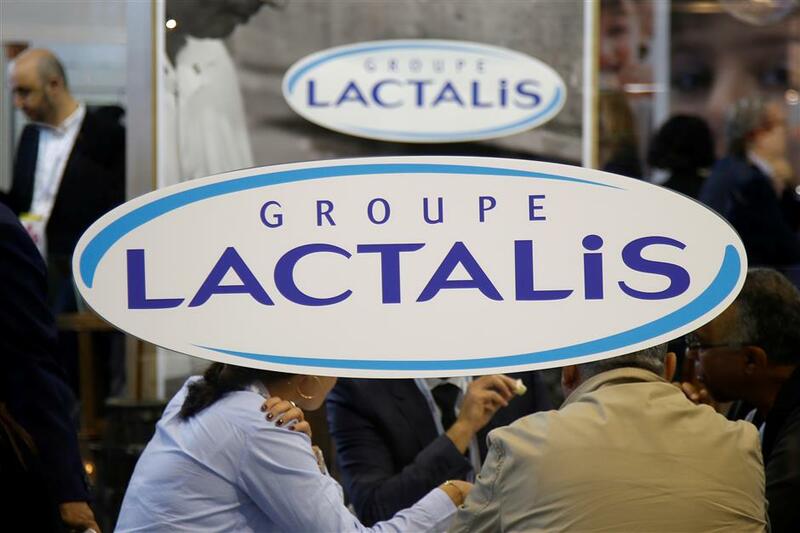 Logo of the dairy group Lactalis are seen at the food exhibition Sial in Villepinte, near Paris, France, October 17, 2016. France said Thursday there has been a "major dysfunction" in a recall of baby milk after stores sold potentially contaminated products despite being told to take them off their shelves. French President Emmanuel Macron added his voice to calls for the culprits to be punished. Lactalis, one of the world's largest producers of dairy products, in December issued a recall of all products made at its factory in Craon, northwest France, after discovering salmonella bacteria at the site. But several retailers admitted this week that they had continued to sell the manufacturer's affected products even after the ban. "This is a major dysfunction in the withdrawal and recall by the operators who bear the responsibility," French Agriculture Minister Stephane Travert told a news conference. Supermarket chain Carrefour said Wednesday it had sold 434 boxes of baby milk produced by Lactalis that should have been withdrawn and Systeme-U admitted to selling 384 boxes. Earlier Leclerc said it had sold 984 affected Lactalis products since the recall and Auchan 52. Hypermarket chain Casino, which also owns the Franprix and Geant franchises, was the latest to come forward on Thursday, saying it had sold a total of 363 items covered by the recall. Industrial leaders, intermediaries and retailers must now "shed all possible light on the failings that they discovered and assure us that none of the products concerned are still on the market or in stores," Travert said. He said no date to lift the ban could be set "while we have not exactly and precisely identified the source of the contamination, and before it has not been clearly identified and removed," Travert said. Finance Minister Bruno Le Maire said Thursday that the anti-fraud unit DGCCRF would undertake 2,500 additional checks next week. He also summoned retail industry leaders to his ministry later on Thursday, and said he would meet on Friday with Lactalis managers who were responsible for the safety of their products and been "found lacking", he said. "This case is serious," Le Maire said. "It has led to unacceptable behaviour that needs to be punished." That sentiment was echoed by president Macron who said that "if punishment is required, then there will be punishment". Speaking at a news conference in Rome, Macron also said that "yes, the French state is able to ensure food security", adding that he had himself asked his finance minister to summon the industry representatives. Last week, a report said that French food safety inspectors failed to detect salmonella contamination at the Lactalis facility three months before the company carried out the recall. Officials from the food safety department carried out a routine inspection of the site in September and gave it a clean bill of health, the Canard Enchaine investigative weekly reported. It was only in December, after around 30 infants fed Lactalis milk had fallen ill, that the health ministry sounded the alarm. Officials from the national anti-fraud bureau swooped on the factory on December 2 and found the assembly line where milk is transformed into powder to be contaminated. Lactalis is blaming the contamination on renovation work and issued two major recalls covering all production from the site dating back to February 15, 2017. The plant has been at a standstill since December 8 and said Thursday it put 250 of its 327 staff on shorter working hours until at least early next month. Salmonella symptoms include severe diarrhoea, stomach cramps and vomiting. The illness, caused by intestinal bacteria from farm animals, is especially dangerous for the very young and elderly because it can cause severe dehydration. At least 35 infants in France have now been diagnosed with salmonella poisoning. The product recall, which included the Picot and Milumel brands, affected consumers in countries as far afield as China, Pakistan, Bangladesh, Britain and Sudan, underlining the company's global reach and the difficulty in tracing all the potentially at-risk powder. Lactalis is under investigation over the affair. It could face charges of causing involuntary injuries and endangering the lives of others.